Weekends are an incredibly rare commodity for me. For people who are still in school or are already working, weekends exist to keep them sane, to let them catch up with friends and families or their hobbies, and to let them do their weekly chores (ugh). Well, in my world, weekends are still days when we have to show up to the hospital and do things we always do on weekdays. Actually, weekends and holidays DO NOT EXIST IN THE HOSPITAL. They are completely irrelevant. I mean, whether it’s Christmas Day or Easter Sunday, people still choke, vomit, or pass out, still have to be rushed to the ER, and yes, still need our medical attention. So basically, I’d kill for a weekend off. I’d go on double duty (a whopping 48-hour shift if you can withstand it) just to be able to have a day to myself and to see people I love and be able to go to happy places. So a few weekends ago, I was quite fortunate enough to have a Sunday afternoon off. I was glad I scheduled a meetup with my very good friend Ais. Now, Ais and I had stayed in the same dorm in college and we became close there (sharing the same sentiments about the general culture there and thriving more in the counterculture). But ever since we graduated back in 2009, I HADN’T ACTUALLY MET UP WITH HER! Yes, it had been five years, and it was pretty exciting to catch up and share how much we’ve changed. 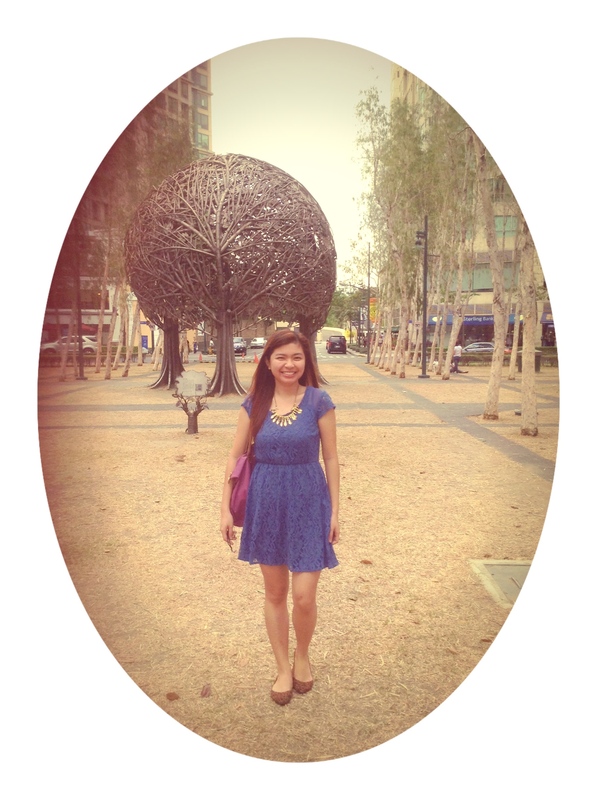 Since she works and lives in The Bonifacio Global City area, we decided to meet at Burgos Circle. I was only to happy to visit her in her neighborhood! 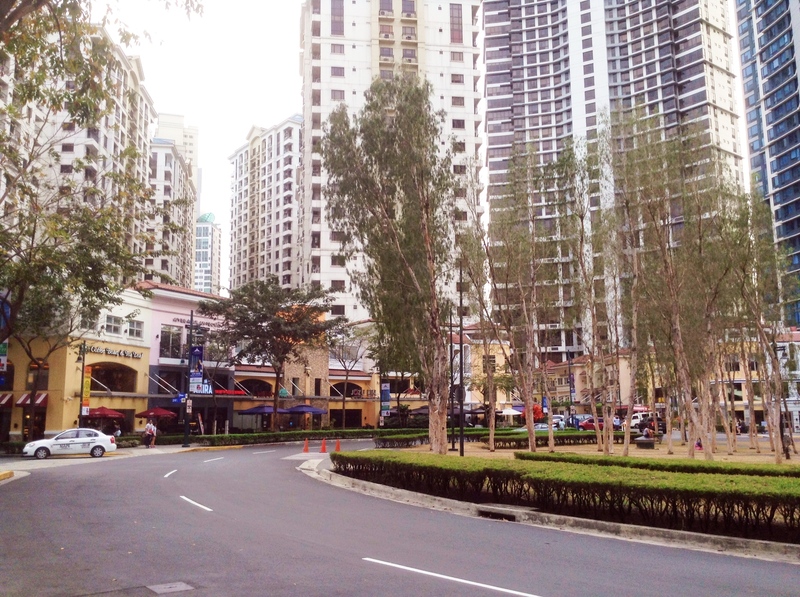 Burgos Circle is very charming and who wouldn’t want to live in such a nicely-planned area, with its surrounding coffee shops, restaurants, and bistros and very worldly ambience? It was a treat for me just to walk around the place! It honestly reminds me of one of my favorite streets in Singapore, Duxton Hill. 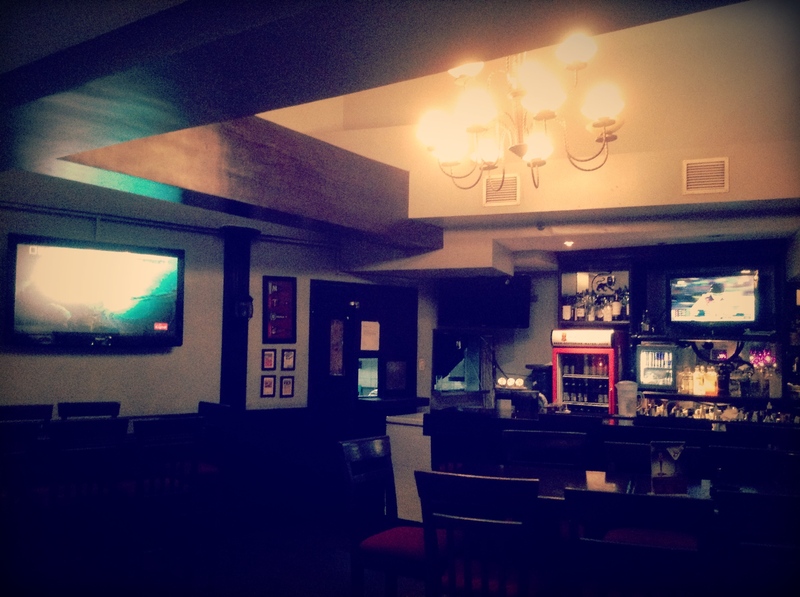 (For the curious, here is a link: http://urbanjourney.com/food-and-drink/good-restaurants-in-duxton-hill-665). I like how open the vibe is, how people can just dine al fresco and enjoy the afternoon breeze, and how chill and spontaneous it is. It’s very hip, yet laid-back at the same time. I’d rather go to these kinds of places and have coffee or a lunch date with a good friend rather than frequent the ubiquitous malls, basking in the artificial glow of shop lights and advertisements, and focusing more on shopping rather than on conversation and great food. I used to be that kind of girl, but as my life has become more hectic, I find that I enjoy quiet dates as opposed to frenzied shopping and crowded places. I’m a girl who loves gardens and open spaces. 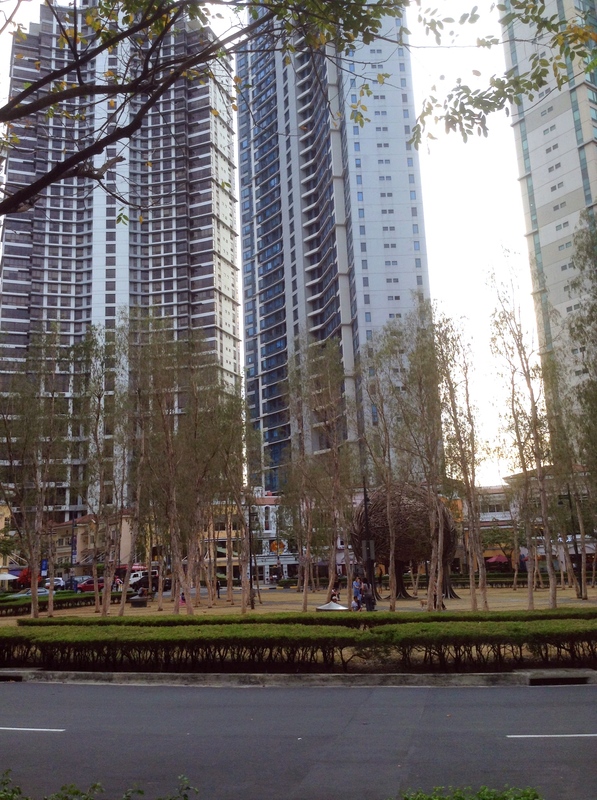 To see a place where you can jog, walk the dog, sit on a bench, or just simply ruminate about your day right smack in the middle of tall buildings, condominiums, and establishments is simply refreshing! 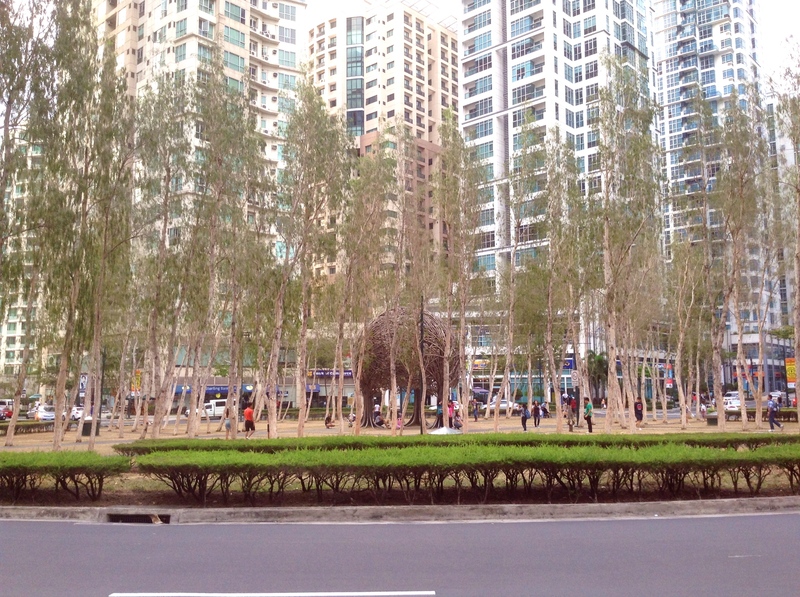 Kudos to those who did the planning for Burgos Circle because they got something right: they thought that it’s important to put up a green space. One of my strange quirks when I go abroad is to hang out in parks. The most memorable ones for me are Bishan Park in Singapore (http://www.nparks.gov.sg/cms/index.php?option=com_visitorsguide&task=parks&id=8&Itemid=73) and The Boston Common in, of course, Boston (http://www.cityofboston.gov/freedomtrail/bostoncommon.asp). I love wandering and roaming around in parks because the lush greenery renews me. I guess this is connected in some way to my upbringing – as I grew up in La Union and I was used to seeing trees, fields, and gardens everywhere. 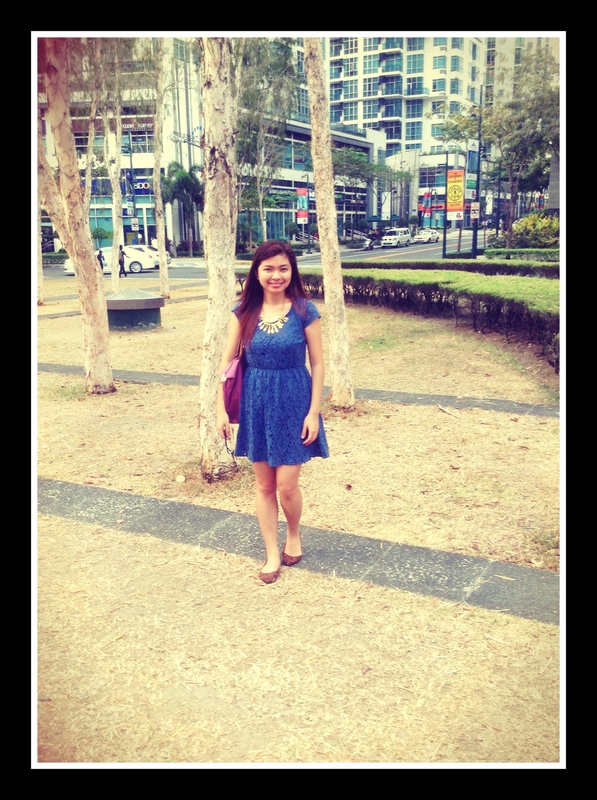 Though I’m a city girl at heart, a part of me still came from the countryside hahaha. (My guy best friend in med school used to tease me Promdi because I grew up in the province. All hell will break loose when he reads this – more Promdi jokes…). I’m just happy that developers here are taking a cue from First World countries and developing beautiful places. When I first saw this, my first thought was, “Oh, it looks like The Bean in Chicago!” (http://news.cnet.com/8301-13576_3-57592388-315/in-chicago-the-bean-is-perfect-interactive-public-art/). I’ve never been there yet, but the shape struck me as similar. 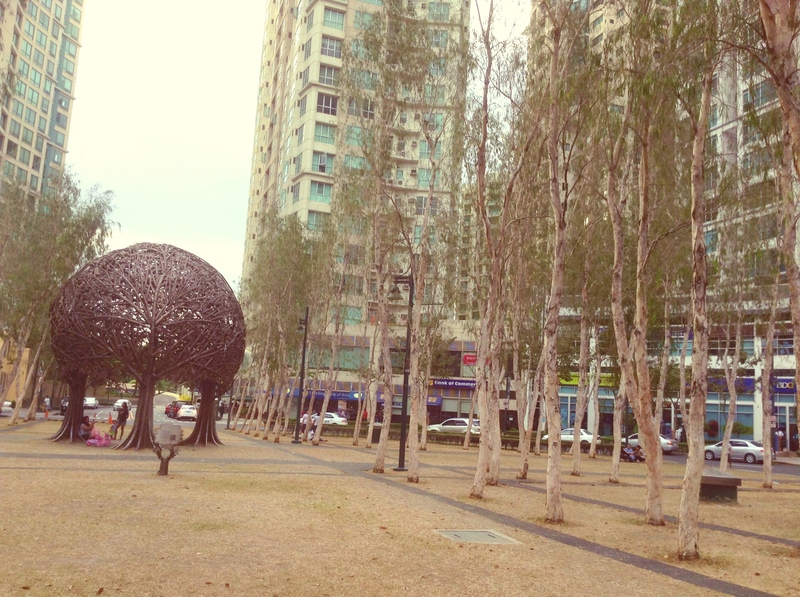 It is actually called “The Trees” by Reynato Paz Contreras (read the link to know what it symbolizes: http://numateasalon.wordpress.com/sculptures-at-fort-bonifacio/). At the end of the camwhoring, I told my friend what a lucky person she is for living just a buildings away from this area. Of course, after all that roaming around and catching up (“walking and talking”), we got hungry and found the perfect place. Imagine two dressed-up girls walking into a Mafia-inspired, dimly-lit pub. No, we weren’t thinking of being dainty that afternoon and sipping tea from fine china. We wanted to do it our own way – the alpha-female, what-the-hell-I’ll-break-the-rules kind of way. We sat ourselves on high bar stools, never mind our that our hemlines were also high. Hahahaha. We were girls on a business: to continue catching up with no-nonsense comfort food and drinks with a bit of a kick. I present to you Bugsy’s Bar and Bistro for this very purpose. (See for yourself: http://www.bugsys.com.ph/). Boy, oh, boy, did we have no regrets! The food was seriously COMFORT FOOD. 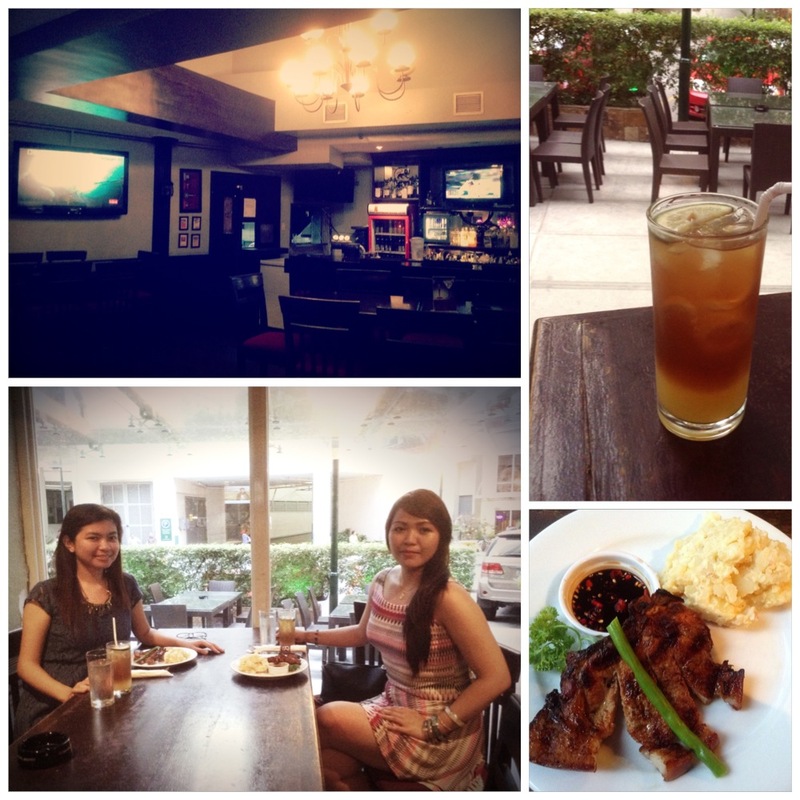 We both had grilled pork chops with mashed potatoes and washed it down with Long Island iced tea for some hint of alcohol. I tell you, the pork was grilled to perfection, juicy, and had enough flavor from the char and marinade combined. It was also not very fatty, which is very important. It came with vegetable sidings and the creamiest mashed potatoes ever! I proclaim it to be THE BEST mashed potatoes I’ve eaten (disclaimer: SO FAR). I was so satisfied with the meal I had no more room for dessert after. A good meal is a hundred times better if you pair it with good company and good conversation. It is indeed true what they say that real friends will feel as if nothing has changed between them even if they haven’t seen each other for years. Ais and I took divergent paths after university: she went to the corporate world and I went to the medical field. She then pursued an MBA and is back in the corporate world, very much happy with her job. We may have become richer in life experiences after university, more so because we each went through our own quarter-life crisis. But you know what, our core personalities and shared values are still the same and that’s why we felt like no time passed! We may have been less healthy and less balanced people back in Ateneo, but even then, we were already practical, driven, and in love with ourselves. Hahahaha. Cheers to success, return-of-investment, and happiness! Thank you for that fabulous Sunday, Ais! 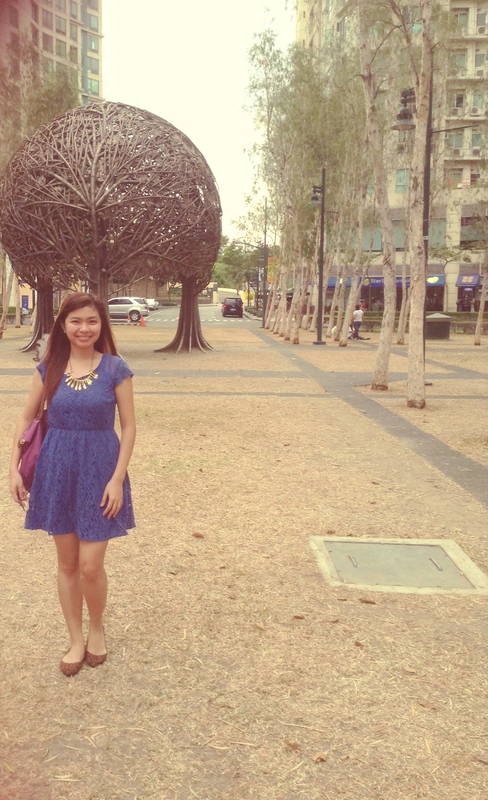 Burgos Circle now has a special place in my heart. 🙂 It is where I realized an old friend has now grown into a confident and self-sufficient woman and I am very proud of that.